"The GS-R24 is a lovely desk that takes the excellent sonics and operating concepts of the ZED-R16 and expands upon them to make an even more powerful and better integrated studio console / workstation." GS-R24 combines refined analogue quality with a choice of analogue or Firewire / ADAT interface modules and MIDI control for your chosen Digital Audio Workstation or recording device. Designed to sit at the heart of a busy project studio, GS-R24 has the flexibility and audio excellence to enhance the impact of your recordings, whatever your workflow. A version with motorised faders, GS-R24M, is also available. GS-R24M is identical to GS-R24 in all other respects. The GS-R24 adapts to the way you like to work. Routing switches for the interface allow the signal sent to the DAW to be sourced either directly from the pre-amp or taken from after the EQ and DAW return (or track return) buttons switch the signal from the DAW into the channel at either the pre-insert point or post EQ. Using these routing switches the GS-R24 can be set up to send a non-EQ’d signal straight from the pre-amp (also using the pre-amp signal as a source for the auxes), providing zero latency monitoring. Alternatively, the record send can be EQ’d with the DAW track switched to the fader - a similar configuration to a traditional “inline” channel path providing a monitor mix on faders sourced from the equivalent of the tape machine replay head. Or the DAW can play straight into the insert point and EQ for equalisation during mixdown. With its fully parametric mids, GS-R24’s EQ provides tremendous corrective and creative equalisation. The Q is continuously variable from 0.8 to 6 and the low mid sweep extends down to a super-low 18Hz for controlled band-pass equalisation at bass frequencies. The circuit implemented ensures low noise contribution and minimal distortion at all settings. GS-R24 puts you in control of your DAW. In addition to the MIDI transport controls, there are rotary controllers, switches and a jogwheel to give you easy control of the track pane in the DAW. The 24 channel faders are MIDI enabled for multiple control of DAW levels, and the channel Solo switches can also be used for solo, track arming or muting DAW tracks. On the GS-R24m the channel faders are also motorised so they can follow automated moves recorded to assigned parameters in the DAW. The input channels can be monitored either pre-fade, post fader in stereo, or solo-in-place. This makes the GS-R24 a joy to use during both tracking and mixing processes. There’s even 5.1 surround monitoring facilities for producing surround sound mixes. The six auxes mean you can create plenty of artists’ cue mixes, while Studio 1 and Studio 2 mixes can be fed by auxes, groups, L-R and Mono outputs. A choice of Analogue or Firewire 32 x 32 channel interface modules are available to purchase, enabling easy integration with your DAW of choice. The interface can be switched in and out of different points in the channel path allowing for different workflows from dry multi-tracking to mixdown, dubbing, processing effects or even using the GS-R24 circuitry as analogue plug-ins in your DAW. The slimline RPS15 power supply unit is a high performance, low noise linear power supply producing DC voltages by rectifying, smoothing and regulating AC voltages from the secondary windings of a mains transformer. 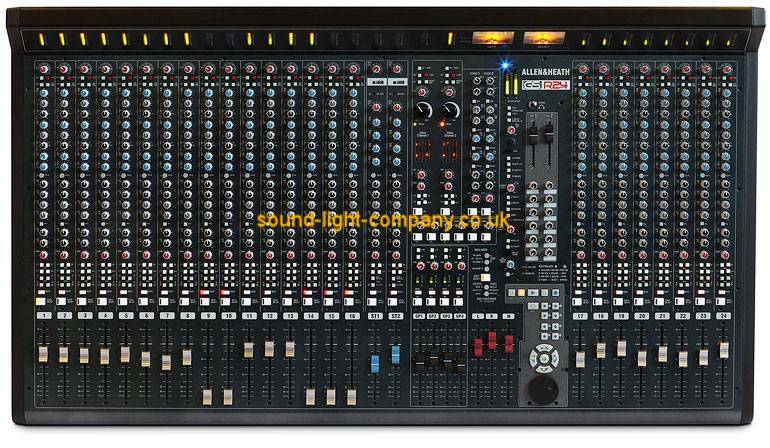 Allen & Heath mixing consoles employ a number of DC voltage supply levels in their operation and these are provided at the output of the power supply unit. Full protection and thermal sensing fan cooling ensures the power supply unit will operate consistently. The RPS15 is purchased separately. *Interface modules and the RPS15 power supply are purchased separately.